The game, Elvira: Mistress of the Dark, was only loosely based on the movie, as I learned only long after I had first played the game. Perhaps it was mostly thanks to this, that the game became more of a cult hit outside of the USA than the Movie Macabre series or even the movies were. While there's trouble in every paradise, Elvira's problems were overshadowed by the utter brilliance of the game's horror elements. It wasn't really until very recently, that survival horror games began to be more horrific than Elvira's adventures. Even now, the game has rather nice ratings at our favourite haunts. At LemonAmiga, the score is 8.27 from 84 votes, which is not too far from the Top 100. At Lemon64, the score is 8.4, which would place it within the Top 100 there, but it only has 33 votes, which doesn't quite make the cut. At AtariMania, the score for the ST version is considerably lower at 6.4 with only 21 votes - curious. The MS-DOS version has a score of 4.56 out of 5.00 from 27 votes at MyAbandonware, and 3.2/5.0 from 10 votes at MobyGames. As expected, the PC-98 version has no reviews to be found. Let's hope the damn thing works, then. There is not much that the movie and the game have in common, apart from the title and a central plot item being a spellbook. While in the movie, Elvira inherits her great-aunt Morgana's house in Massachusetts, and does pretty much everything necessary - after all, she is the protagonist - in the game, the situation is very much different. In fact, the game continues the plotline from the movie, and deals with the situation Elvira finds herself in now that she has also inherited Killbragant Castle, the former residence of both her evil uncle and that of her ancestor, Queen Emelda. She is being held captive by dark forces within the castle walls, and needs to get you to help her out of her predicament by killing all the unwanted residents of the house, and help her prevent the imminent return of the long-dead evil sorceress. Her brief appearances, as well as the actual premise of the game, finally give reason for the Elvira's self-claimed title, instead of just being more of a campy B-movie horror hostess name. Elvira: Mistress of the Dark can be categorized as both a point-and-click adventure and a first person action-RPG, in the style of Dungeon Master. The most obvious difference to Dungeon Master, of course, is the fighting system, which is really Elvira's downfall, if any, but even that can be overcome by practice. The other obvious difference is, that you're going through the game as a lone adventurer, with only the occasional help from Elvira herself, but the lack of commandable characters is compensated by a rather falsely claimed seemingly endless amount of space in your inventory. 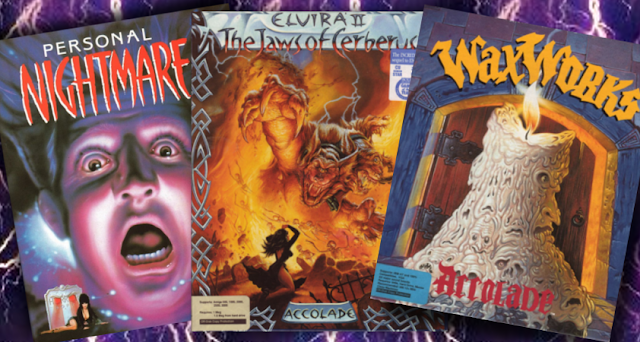 Seeing as Dungeon Master and its most immediate kin were rather compact games, mostly due to a relative lack of variety in graphics, Elvira's first adventure must have come as quite a shock back in the day with its massively diverse and impressive graphic design, which do take quite a lot of disk space - 5 disks on both Amiga and ST, and 3 disks on PC-98. Therefore, playing E:MotD on a bulk Amiga 500 or Atari ST is, admittedly, infernally cumbersome, but happily, all 16-bit versions of it are HD-installable. Through emulation and modern devices to replace old failing media, playing large games on old machines is more comfortable than ever. Even the C64 version can now be played from an EasyFlash cartridge, so anyone interested in making your own discoveries for all versions can do so with relative ease. However, part of E:MotD's charm back in the day was waiting for the disk to load and discover, whether a disk change would result in a swift death. Dying in Elvira alone would make for a singular adventure, as you tried to find all possible ways of dying and the resulting variety of death animations. I mean, really, this is exactly what horror games should all be about - having fun scaring yourself to death in various ways at every other turn. Make no mistake, Elvira: Mistress of the Dark, even with all its flaws, was an achievement of the highest order, and should be a part of every gaming historian's to-do list. In essentials, E:MotD is a first-person point-and-click adventure with role-playing elements, featuring combat and character progression. Controller-wise, there is nothing really groundbreaking to tell you about Elvira: you either use a mouse, which is the more common way to play it, or a joystick, which is the C64 way. Already at this point, however, you might notice an obvious difference in gameplay: a mouse has two buttons in use, whereas an Atari-based joystick only has one, which has great potential for causing problems. Of course, there being only a C64 version from the 8-bits, and the rest of them being 16-bits, this might well turn into a simple review of the game, but at least we can count all the ways the C64 version differs from the more hi-def versions. First off, the cutscenes on the C64 are mostly shorter, which can make some segments of the game quicker, but since there aren't that many cutscenes in Elvira to begin with, it doesn't make that much of a difference. Some of the puzzle elements are missing, such as the need to practice using the bow and arrows - there is no practice area in the gardens. The biggest differences are in the fighting bits, however. On the 16-bits, your stance switches between defensive and offensive, depending on how successful you are at getting hits onto your enemies and blocking their attacks. Also, killing an enemy is not much of a chore in the beginning, and all the enemies are differently ranked by colour, which indicates their power and stamina. On the C64, you're in a constant state of luck-based offensive/defensive stance, neither of which work really well, and all the attacks performed by your enemy and yourself are performed from one side, so you never really have a real chance of benefiting from experience - it's all just luck, which is mostly bad. According to the C64 version's manual, you are on the offensive whenever the sword icon is displayed, but when you lose the initiative, the shield icon is displayed instead, which is when you are supposed to click on the "block" button as quickly as possible. It doesn't seem to work well enough that way, and I have never managed to survive more than three enemies in one game, so I haven't really managed to get too far in the C64 version. If any of you readers have had better experiences on the C64 Elvira, share your tactics, please. From what I can tell, apart from the Japanese dialogue text in the cutscenes (and in everything else written on the info panel) in the PC-98 version, all three 16-bit versions play exactly the same. It is odd, though, that only the messages are written in Japanese, but not the menu items. Anyway, you control the game with a mouse, and the biggest advantage to the C64 version is that you can attack and block on both mouse buttons with a different action for each button, as shown in the fight controls. Left mouse button for lunge when attacking and block when defending, and right mouse button for hack and parry, respectively. What that means in practical terms is, that when your enemy attacks to your left side, you defend with the left mouse button (block), and when the attack comes from the right, you defend with the right mouse button (parry), and the same thing with your attacks. Alternately, you can click on each menu item with the left mouse button when appropriate. Now, for the uninitiated, Elvira: MotD can be a confusing experience, and for many of you somewhat experienced gamers, it still might be. For me, the biggest problem was that back in the day, the version I played was a pirated one, with little hints available as to what I was supposed to be doing and when. Much later on, I found out that the game had a spell book shipped in the box, which includes all the necessary recipes hidden behind a bunch of red text, through which you would only be able to see with red glasses, which were also shipped with within the box. An annoying, but up to a certain point, a fairly effective method of copy protection lumped together with an integral part of the game's proceedings. In order to defeat certain enemies, you would need to kill them with spells, all of which require mixing in the cauldron in Elvira's kitchen. However, to gain access to the kitchen already requires killing a couple of enemy guards, so the C64 version doesn't really give you much of a chance at making progress in the game. However, to make things simpler, the C64 version doesn't have quite as many kinds of enemies as the 16-bit versions. It's always good to remember, that you can back up from an enemy before engaging them in battle, but once a battle starts, it's do or die, and the cold fact is, you can't really run away from fights forever. As the game manual tells you, your inventory is quite large, and "you can carry an amazing amount of stuff, so don't be shy. Help youself to anything in the castle that isn't staked down." True enough, but what the manual doesn't tell you, is that there is a very finite amount of baggage you can handle at once, and different items weigh different amounts. Just for the sake of thoroughness, I can tell you that the C64 version doesn't feature nearly as much of items as the 16-bit versions, which makes it easier to, for example, compile different magic potions and such. Of course, the manual tells you a lot of other things as well, which would just be waste of space here, because you do need to read the manual regardless, if you're going to play E:MotD further than Elvira's kitchen. What I should still probably tell you, even though most of this information is from the manual, is the contents of the stats bar, because the C64 version is missing one element from it, and that is the EXP slot, which tells you how much of experience points have you gained. If something is to be understood about it, the only real RPG'ish element of actual character development has been taken away from the C64 version. Tsk, tsk. Anyway, the other five items are: STR (strength) for telling how much you can deal damage, and how strong/weak you are; RES (resilience) tells how much damage you can take; DEX (dexterity) measures your agility, and your ability to gain advantage at the start of a fight; SKI (skill) increases with each successful combat, but different weapons need different skills; LIF (life) tells how alive you are. Most of these items can be boosted with magic potions and such, if available. There is no other way to put it, than just admit that the C64 version is a cut-down version of the full game, with a good deal of artificially generated difficulty to make up for the relative lack of content. It doesn't make the game any more horrific, if horror is what they were aiming at. The horror is in getting the mood right, by using detailed graphics and a properly haunting soundtrack. Which is why it's useless to talk about the playability any longer. 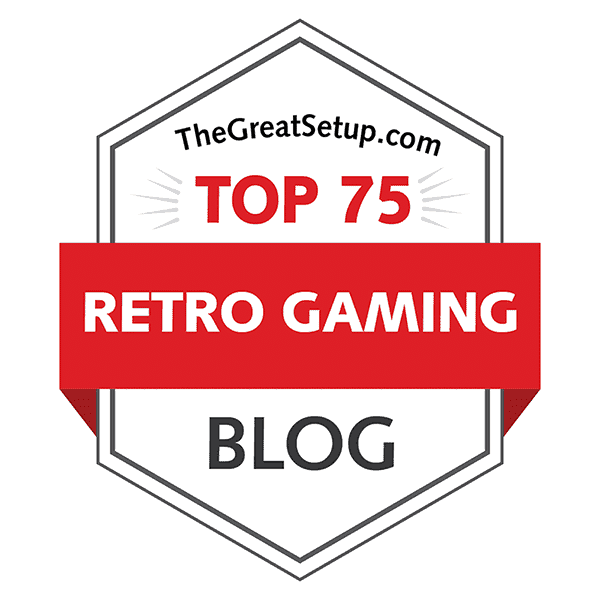 Let's just say that for the majority of gamers, the DOS, AMIGA and ATARI ST versions are the way to go, simply due to the language barrier in the PC-98 version, but the DOS version is probably the easiest to get running from a hard drive. Otherwise, the Japanese-speaking version is still miles better than the C64 attempt, although I'm not blaming Flair Software for what they did - it's probably still the best Elvira game the C64 ever could have had at the time. Quite clearly, the horror elements in Elvira's gameplay came from the restrictive and often badly responsive controls, so bulk of the actual horror was to be supplied by graphics and sounds, as it has been in movies since day one. But you have to give Horror Soft some slack, because graphic horror wasn't really possible to do properly until the 16-bit platforms allowed more colours and better screen resolution for more detailed graphics - the game engine was probably chosen because Dungeon Master clones were a big thing at the time, and 3D games were on the verge of breaking out. Title sequences. Top row: Commodore 64. Middle and bottom rows: Atari ST, Commodore Amiga, IBM-PC compatibles and NEC PC-9801. The content of the title sequences depend mostly on whether you're playing any of the 16-bit versions by Horror Soft, or the C64 version by Flair. In the C64 version, the title sequence consists of the Flair Software logo and the game title logo screen, in which the title morph-reveals itself from clouds around the moon. Aside from that, there's only the basic text scroller at the bottom, featuring the obvious copyright things, but because you also get a title tune, all this is looped infinitely, until you press the joystick button to continue into the game. 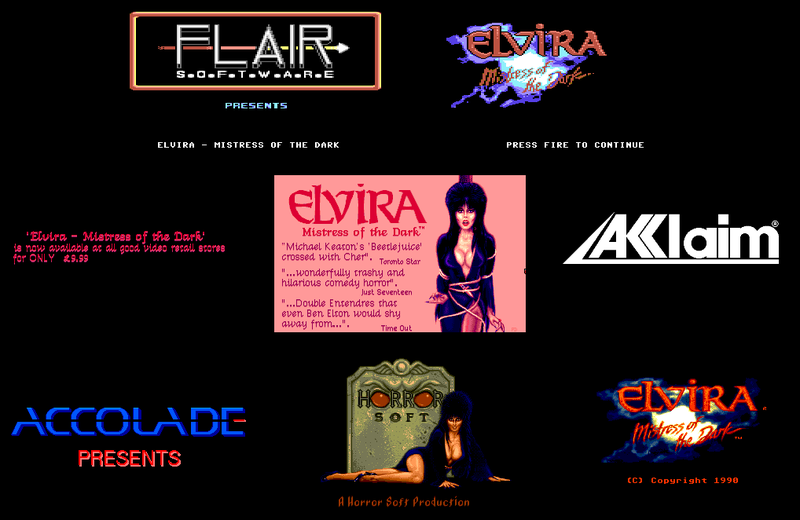 All the 16-bit versions feature the Accolade logo essentially in its usual classic form, a Horror Soft logo featuring Elvira posing in front of a tombstone, and the same game title screen as the 8-bit sequence. If you happen to have a less cracked version at hand, you will also see two other screens prior to the aforementioned title sequence, which advertise the Elvira movie. The NEC PC-98 version, being published through Acclaim Japan, also features a simple black-and-white Acclaim logo before all the other screens in the title sequence. It doesn't really make it any better than the other 16-bit versions, though - it's just a single additional screen that doesn't bring any improvement to the game's overall graphics. A few random map locations. Top row: Commodore 64. Bottom row: 16-bits. Despite being located mostly inside a castle, E:MotD is a very colourful game. Already from the first in-game screen, you can see that there will be parts where you roam within the castle and outside of it, which includes a garden with a hedge maze. You can also get under the castle, which requires you to dive into a well. The passages themselves aren't all that horrific - after all, it's just a castle like any other. At this point, even the C64 version looks okay, even though it's nowhere near as pretty as the 16-bits. Some of the first key rooms. Top row: Commodore 64. Bottom row: 16-bits. Here are a few of the key rooms from early on in the game, because it's difficult enough getting into those in the C64 version, so I will only compare those with the 16-bit equivalents. Although you can see the lack of detail and colour in the C64 graphics, it's not nearly as bad as what's missing in usable items and other interactible elements. Still, all things considered, the C64 conversion (demake?) still manages to be surprisingly faithful to the original. Close-ups. Top row: Commodore 64. Bottom row: 16-bits. This is where the C64 version starts showing real lack of concentration into details. Whereas the 16-bit versions have been taken proper care of to look as haunting in every possible aspect, the pictures most needing of detail are severely lacking in: the blind gatekeeper has almost normal-looking eyes, the dead gardener has no maggots crawling around and in his opened throat, Elvira's little speech is not animated in any way, and the bed-ridden vampire lady has no lush red lipstick or even any curve in her bosom, as there should be... just to give you a few examples. Obviously, all the initial close-ups of the enemy puzzle screens are supposed to be somewhat safe-appearing or even fascinating before they give you the scares. The C64 version just doesn't cut it. Fighting scene variations. Leftmost: Commodore 64. Others: 16-bits. The fighting screens are, from what I could find, pretty much all the same on the C64, although I'm sure you could meet some other enemies, if you ever have the luck of getting past more than three enemies in one session. But, from the immediately accessible areas past two or three enemies, all the enemy types I could come across were regular guards with differently coloured outfits in the screens you meet them, but in the actual fighting scenes, the colour is always the same. The 16-bit versions feature at least three different colours in the fighting screens, as well as clearly different types of enemies in easily accessible areas, not even counting all the puzzle enemies. Also worth noting is, that on the C64, all the enemy attacks are pointed to the right side of the screen, since you are only able to use one block and one attack, while on the 16-bits, the enemy attacks go both left and right. Player's death screens. Top: Commodore 64. Bottom: 16-bits. As a final nail in the C64 version's coffin, it features only one death screen, compared to quite a few more on the 16-bits. I still haven't managed to find them all myself, but there's a video on YouTube, which compiles all thirteen 16-bit death screens. The above picture only shows some of the most easily produceable deaths. To the C64 version's defense, at least it features the death scenario animations leading to your imminent Game Over, which are surprisingly well-made. Screenshots from the EGA mode in the DOS version. We end this section with a few screenshots from versions that wouldn't be otherwise all that necessary to show, but for the fact that they exist. In the DOS version, there are two graphic modes to choose from: EGA and VGA. The VGA mode looks very much the same as any of the other 16-bits, while the EGA mode uses much less colour, and in terms of overall quality, falls neatly between the other 16-bits and the C64 version. Examples of Japanese messages in the NEC PC-9801 version. The middle one tells you to put disk 2 in drive B. The other version is, of course, the half-Japanese NEC PC-9801 (and its compatibles) version, featuring graphics otherwise exactly the same as all the other 16-bit versions (not including the DOS EGA mode), but all the messages are written in Japanese, making it practically impossible to play for anyone with no Japanese language skills, unless you know your way around in the game by heart. Unless the only PC-98 version I've found on the internet is a cracked one, it doesn't seem to feature the movie advertisement screens, but let's not hold that against it. Most horror fans will agree with me, when I say sounds are just as important, if not more so, when it comes to making any horror movie or game effective. It's not just about NOT playing "Yakety Sax" whenever you get into a surprise fight with a monster, but also, the sound effects need to be properly haunting - perhaps understated, but effective. In the case of Elvira: Mistress of the Dark, you are given a soundtrack, which changes tunes according to location. Not very often, but still. Since I have never actually managed to complete E:MotD myself, I had to resort to a longplay video on YouTube to check, how many tunes does the game actually have. The problem is, though: nearly all versions have different soundtracks. I'm going to start with the AMIGA version, because that's the version I'm most familiar with, and can speak of it with at least some credibility. From the intro sequence until the first screen of the game, you can hear a growing sense of dread, starting with loud church bells, then a fading-in short mallet melody in natural A minor that only goes for two beats and loops for quite a while. On top of that, a very 80's drum pattern and a D minor / C major chord sequence are introduced, and variated until an abrupt end. Clearly, it wasn't meant to be listened to until the end, since you're probably going to start the game as soon as you enter the first screen. After taking your first step forward, the music switches to a very haunting background noise with a constant F-sharp pad sound in the background, coupled with lots of bubbly noises, occasional bass drum and/or heart beats, random cymbal hits and very odd whirly sounds that build the melody of sorts for this track. The second tune is triggered when you enter the gardens, and it starts off as a slow synth-choir-like thing in E minor, and builds up to feature a slow drum beat at some point. This tune is much more structured and decipherable than the earlier one. A third tune, and so far the most "upbeat" one, if you can call it that, is played in the prison block. It still features a slow beat, but it's less haunting than it is actiony, as it features very pop-oriented chord progressions and melodies. There's another tune made strictly to be played within the confines of the chapel, and it is made of strange synth choir sounds with exotic pseudo-classical chords, which doesn't actually resemble any particular classical era of music. Yet another unique tune is reserved for the catacombs section, which is stylistically similar to the tune in the prison block. So, five tunes in total. Only the diving sections have no music at all - at least, not as such, but rather a very strong heartbeat and some watery/bubbly noise in the background. In addition to that, there's plenty of other sound effects to go with all this music, too. All the fighting sections have swords clinking noises, sword swishing and yells of an enemy taking a hit. 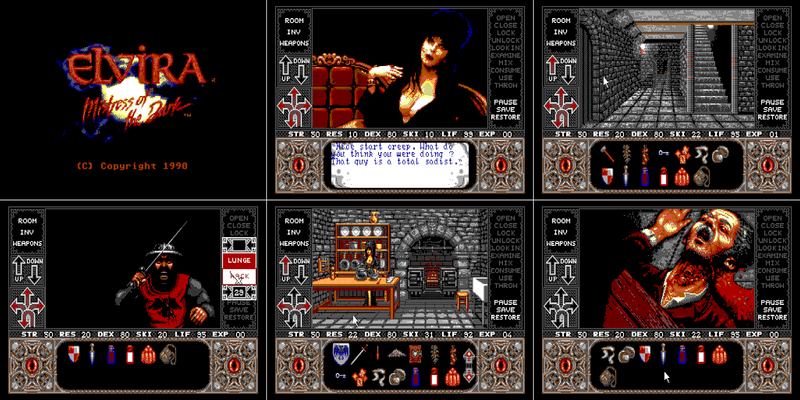 Some of the cutscenes and puzzle-enemy screens have suitable effects, as well, such as Elvira speaking a few words in the beginning, the bed-ridden vampire screaming at you, that sort of thing. I did expect more of it, but the music and graphics make up for the missing sounds. There's enough of slamming doors and other incidental sound effects to keep up the mood. The ATARI ST version starts off similarly enough, even though the method used to make the title sequence tune is strictly chipsynth-based, which takes away most of the sound of dread that was incorporated with the church bells and mallets in the AMIGA version. The first real in-game tune is a completely unfitting bit-pop tune, which would be more at home in an action-platformer from 1988. It's not a bad tune, just not at all horror-mood-enhancing. Worst of it is, though, that it's the only tune the ST version has as an in-game tune. Happily, you can turn the music off if you like - in this case, it serves the game better. At least the ST version features all the same sampled sound effects as the AMIGA version, but some of the sounds seemed to play a bit slower. Might have something to do with the TOS I was using to play the game, but I'm not entirely sure, since the game only seemed to work properly on the 1.06 UK version of TOS. Now, the DOS version is a difficult one to get through, because you can choose from 7 proper sound cards and the internal PC speaker. I'm going to focus on the most different ones from each other, at least from the ones I'm able to get working on DOSbox. The beeper version is almost what you would expect it to be: the music is your basic no-tricks beeping all the way through, but the sound effects are samples - yes - played through the beeper too, and the music playback is halted while the sound effects are played. You can't really make heads or tails out of the tunes unless you've heard the multi-channel versions, so let's proceed on to the actual sound cards, then. I couldn't get anything out of the Tandy/IBM 3-voice choice in my normal mode, and when I switched on to use my Tandy settings, I couldn't get the visuals to start, only a bad version of the title tune started playing, so we shall move on to the next card on the list. The AdLib setting has the music sound like there's something missing, but otherwise, it feels fairly familiar. True enough, when I switched on to SoundBlaster, it sounded exactly like the AdLib setting, but there was a certain percussive instrument added into the mix. Also, the sound effects are garbled mess on AdLib, while the SoundBlaster uses the samples - in correct pitch, too. The music itself is not quite as horrific as that in the AMIGA version, but there's a similar amount of tunes that are used in similar ways. Somehow, while playing Elvira with SoundBlaster, I get the feeling I'm playing a mixture of Leisure Suit Larry 3 and Doom. Often hailed as the weapon of choice for any retro PC-gamers, Roland's MT-32 does sound the most natural of the lot, but still being a MIDI-synth, it doesn't make the game any more horrific than the AdLib or SoundBlaster versions, if the music isn't specifically written for making you soil your underwear. Sure, the music sounds a lot better than the previous two contestants. The sound effects are again samples, but are played slower than in SoundBlaster mode, and whenever a sample effect is played, the music playback halts for the duration of the sound effect. Not my kind of a thing, really. Probably the weirdest mode of the PC version is the Generic MIDI mode, which makes all the MIDI data sound like a piano for me, so basically, the whole soundtrack is played with whatever is set as the default instrument in your MIDI channel. Like in the MT-32 mode, the sound effects are slower-played samples, with halts. The Casio CT-460 mode probably requires a proper card or a proper card emulation to make it sound like it should, but the game does play music even with incompatible sound card, albeit all the percussion is represented by some generic melodic instrument, that makes the whole soundtrack chaotic in a funny way. Come to think of it, isn't the CT-460 actually an old keyboard? Maybe your old PC needs to be connected to the Casio CT-460 keyboard through MIDI port in order to be able to play the music there. It's a weird thought, which I'm not about to go and find out just for the sake of this comparison. If any one of you know more about it, a comment on it would be much obliged. Phew... as if that weren't enough, the NEC PC-9801 version also features four different sound options: internal speaker, FM Sound Board, MIDI LA (Roland MT-32 and other such) and MIDI GM (Roland CM-300 etc. ), and apart from the last one, I got all options working. Happily, it's all the same as in PC's elsewhere in the world, and even the music and sound effects are basically the same as everywhere else. Only the sampled sound effects are of much lower quality than on the IBM-PC compatibles, AMIGA and ATARI ST.
Last, and I'm afraid also the least, the C64 version with its magical SID chip wouldn't really even be able to get the mood right even with proper tunes, because there's just not enough memory and space on the disks to make it worth using samples and all that other modern stuff on the 16-bits. What the Flair people managed to stuff into their 8-bit version, is a theme tune for the title "sequence", if you still want to call it that. It's dark and gloomy enough, but doesn't really serve the purpose of enhancing the game experience itself. There is no in-game music at all, but at least you get some sort of non-sampled sound effects for the most necessary bits. Naturally, most of them are featured in the fighting bits, so the majority of the game is still walking in silence, if you're good at fighting. If it weren't for the complete lack of music in the game, this would have been easily better than the PC/NEC internal speaker modes. As it is, though, the sampled sound effects in the PC/NEC internal speaker modes just barely win over the C64 version. Once again, you might need to keep in mind, that the scores are given on the basis of each version's placing in each section, not their self-worth. The 16-bit versions all look similar enough to each other at best, but sound vastly different from each other on different sound cards/chips. The C64 version looks amazingly good, not just for being a C64 game at this point in the machine's commerical lifespan, but generally in C64 game graphics, but it's still not nearly enough to give the 16-bits any competition; and... well, you know the rest, if you read the whole article. More games from Horror Soft. Horror Soft's other games are mostly carved of the same tree. Their only earlier output was Personal Nightmare from 1989, published for the Commodore Amiga, Atari ST and MS-DOS, and it was more of a graphical text adventure, rather than a Dungeon Master clone. It should be noted, though, that Horror Soft was originally a group of people working for Tynesoft before their bankrupcy, and they survived that particular horror. In any case, the people behind Horror Soft also took part in creating such classics as Buffalo Bill's Wild West Show and the two Olympiad games. The other Horror Soft games include an Elvira sequel called The Jaws of Cerberus, and yet another horror adventure in a Dungeon Master-like engine called Waxworks, both classics in their own right. After Waxworks, Horror Soft morphed into Adventure Soft, and have focused almost entirely on creating their Simon the Sorcerer series. Unfortunately, Elvira's brand was also further exploited by Flair Software, who published the relatively dreadful C64 version of the above adventure game, which is why I shall now tell you about Flair's alternative Elvira game, so you don't have to bother. Released for Commodore Amiga, Atari ST, IBM-PC compatibles and Commodore 64. Until the age of emulation had properly taken off at the turn of millennium, I hadn't even heard of an "arcade" version of Elvira. 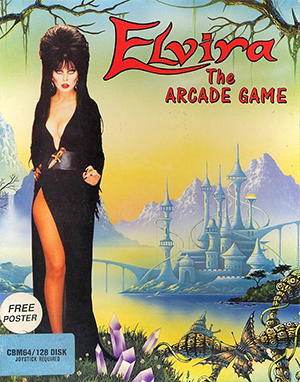 I vaguely remember browsing through the old Lemon64 archives during free periods in school, already keen to find new C64 material to test that I had missed out on previously, and finding Elvira: the Arcade Game, which looked nothing like the Elvira I had come to know and fear. In fact, I thought it decidedly unfitting to have Elvira jump around in a 2D environment, since platformers had never really managed to get the horror aspects of gaming anywhere near enough effective. The first properly darkly atmospheric platformer that I can think of that would even resemble horror, is LIMBO from Playdead, released in 2011. So disinterested I was in the Arcade version of Elvira, that I managed to avoid it altogether until late September 2017. Screenshots from the 16-bit versions. To be honest, it wasn't as bad as I had imagined, but it's not exactly what anyone could call a properly good platformer. The horror elements you experience in Elvira's adventure games are practically gone, even though you do encounter some obviously evil entities. As far as I know, the game only has three extremely long levels, which open up gradually as you pick up keys and other necessary objects to make progress through Hell and Frozen Earth, your ultimate mission being ghostbusting your way through a medieval castle and save the king from within. Again, the game's intro bits are what made the game worth loading up once or twice on the 16-bits, but the C64 version offers no special opening sequence. In all versions, the in-game graphics with their detailed animations are nice enough to watch for a few minutes, but after a very short while, you will notice the gameplay suffers from all the animations being forced to give you some brief glimpses of Elvira's cleavage at every turn. If you manage to waste more than 10 minutes in any version, you might find some points of interest, such as new weapons, rare occurrences of a trader, and some sorts of boss enemies. Of course, this is nothing new for old platforming junkies, who have even had the slightest whiff of games like Flimbo's Quest, Wonderboy in Monsterland or Midnight Resistance. Ultimately, it's the awkwardness of both moving Elvira around and throwing projectile weapons at her enemies, which ruins the entire experience. Too bad, because the graphics are rather nice, and the 16-bit soundtracks are fitting for the intended genre. The C64 version is avoidable at best, particularly the tape version, which doesn't even allow you to choose your starting level like all the other versions do. Now, that's it for this month, hope it was worth the wait! Until the next time, happy Halloween, and keep your eyes open! Thanks for reading, pip-pip!